Gumma said that when she was born . 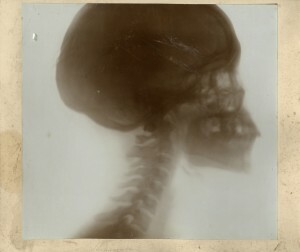 . .
My brother gave me this x-ray to add to the family archives. It is labeled in pencil, “Schrpwunde,” which I have taken to be an abbreviation of ‘Schrapnellwunde.’ If you look carefully, you will see a dense lump at the base of the brain and top of the spine. I showed it to my dentist who confirmed that it is foreign matter and very dense. I know that Lea Risse (our great grandmother’s sister) died in WWI as a nurse. Does anyone know of someone who had a schrapnell wound in their head? I hope some of the German cousins will see this post. This x-ray is German and likely dates to WWI. Prevo Family Archives, Scan 2013. Posted by mary on Friday, August 16, 2013, at 11:23 am. Filed under For Ben, Stallforth/Risse, Uncategorized. Tagged Risse, Stallforth. Follow any responses to this post with its comments RSS feed. You can post a comment or trackback from your blog.